Not everyone is happy to have to use different passwords and go through the same process any time that they want to use an app on the PC. If you use lock app you will be able to view your apps with ease, and be safe in the knowledge that others are not able to see them. There is no end to the apps that can be secured, and it will leave you feeling safe that your details cannot be viewed. It will be able to lock things such as Firefox, Outlook and Skype. With the recent news that fraud is being committed as a result of webcams, it is vital that this is kept secure, and the more secure the system, the safer you will be. There are app locks that have to be paid for, but there are also a lot that are free. They are easy to use and once you have checked the instructions, even a moderate PC user will be able to download one. Make sure that the app you are to use will be strong enough, and is easy to understand. Little could be worse than setting up the system, then realizing that there is a mistake and even you cannot get to see the apps. There are not many steps to set up, but a great deal of care should be taken when following them. Free App Lock is a dream come true for developers who can now back up, encrypt and decrypt files at once rather than get separate software tools for these tasks. 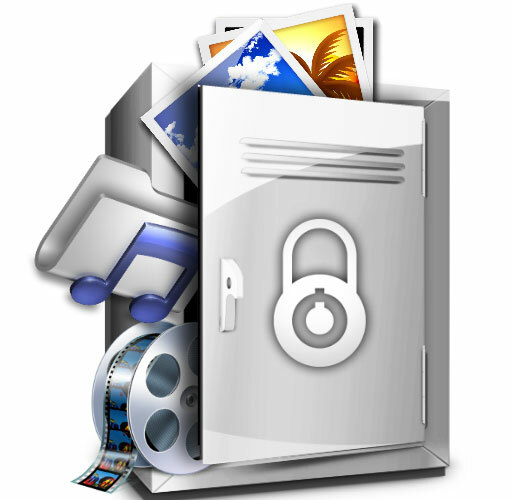 In addition to EXE files, you can unlock and lock media players, games, social networks, and internet browsers with this free software. To operate this software, you should simply right-click your mouse button and a menu with options will appear. This can save your RAM space and time. 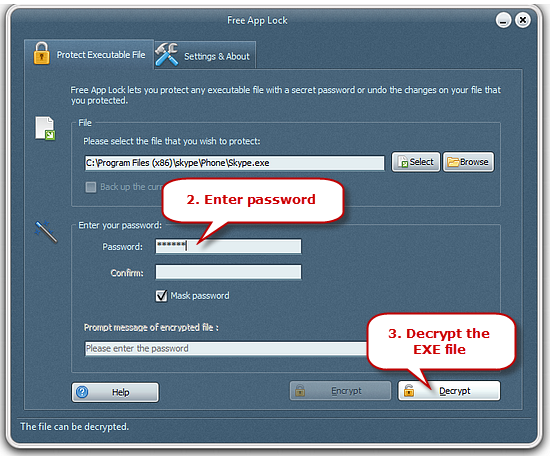 Free app lock software is an idiot-proof tool that you can operate without any prior experience. 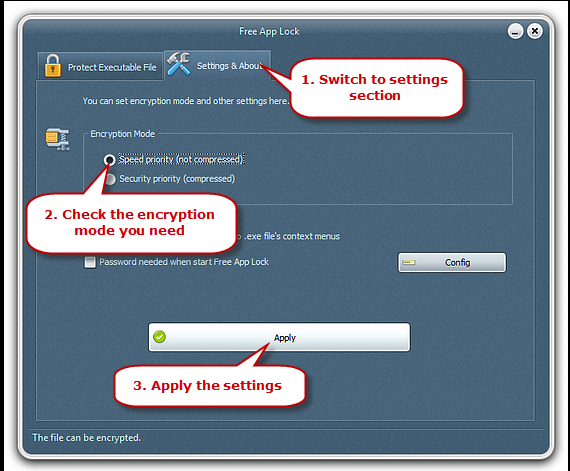 You can enjoy double security as it is possible to lock the Free App Lock itself. The first thing to do is to download the lock app and then launch it. Check the security of the one you will be using as you don’t want to find that the danger comes from the very thing that you are using to protect yourself. Now you can start the three steps to complete the job. Make sure that it is not the shortcut that you are selecting but the app itself. As long as you are in the file section you should get the right one. This will be found in the Protect Executable File tab rather than the one showing settings. You will know you have chosen the right tab as there is a padlock in the top left-hand corner. As with all security, there needs to be a password. 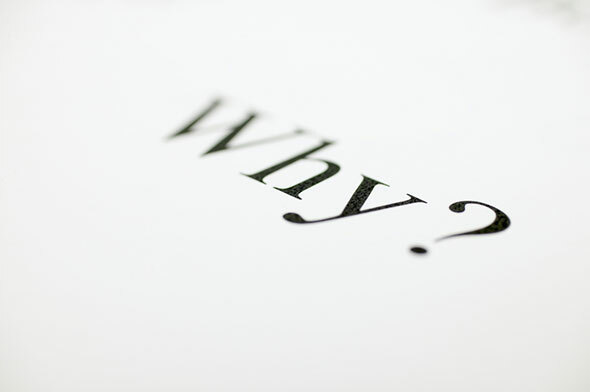 It should not be something that you use for other actions, and should not be something others may guess. You have to get it hard enough that others will not be able to work it out, but something that you will remember. It is other people you are trying to lock out of the PC not yourself. Once in the Enter the Password area, you can fill it in one of the boxes. To make sure it is secure, it will need to be entered again. If there are any mistakes and both are not identical, they will be rejected, and you will have to enter again carefully. There is a box that can be unchecked so that you can see what you are typing. Often the problem with non-matching passwords is the fact that the person entering the details cannot see what it is they have typed in. Once you have entered the password, it will be best to check the box again. This way anyone who sees you enter your password will not be able to read it. If this happens, no level of security is going to be good enough. 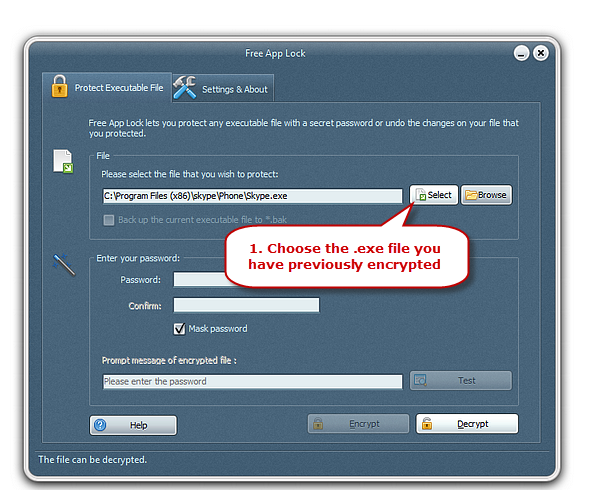 Encrypt and decrypt can be clicked to allow the process to start. The button is at the bottom of the window. There is not a limit to how many apps that can be protected. If you are prepared to take the time to protect them, then they will be secure in a matter of seconds. There are many reasons why you may want to protect your apps. As with many people it is just to make sure that what you do is known only to you. This does not mean that there is anything wrong or untoward, just that you want some privacy. There can, however, be reasons why apps need to be locked. Online gambling is big business and if it is becoming a problem, then this will allow the apps to be locked and not accessed. This is slightly different as it will be others who need to lock the apps and know the password. It may be hard to let someone else have control over areas of the laptop, but it is for the best. The same applies to over-spenders. Not being able to get onto certain sites will save money and it is going to be much more effective than expecting willpower alone to work. A further use will be on children’s computers. How often do they say they are going to tidy their rooms, or do their homework, and then it becomes clear that they are playing video-games? Adults will be able to apply the locks, so that they are in control of the amount of time that is spent playing. OK, so it won’t be a popular decision, but it will be for the best. As you would expect, the ability to lock app is up to date. It may not be the case that the system is totally perfect, but it will certainly give the security that it promises. To ensure the most important information you have is safe will only take a couple of seconds, and once in place, only you will be able to remove it. Users will be pleased with how quickly they pick up how to use it, and how much confidence the app lock software gives them when it comes to saving precious documents. Some will give the choice of priority locks – speed or security. Depending on the app, you choose what you want, then choose a password, enter is again and then all that is left is to encrypt.